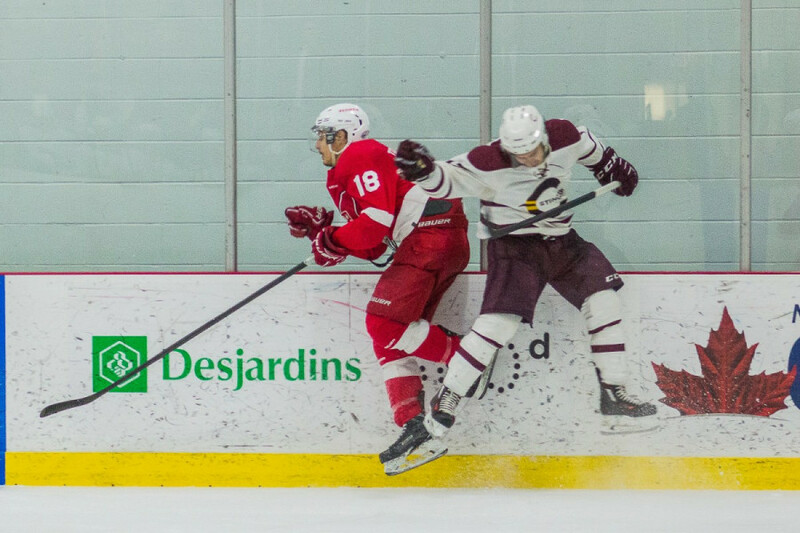 It seems that Concordia and McGill’s men’s hockey teams are destined to fight it out until the last possible second this year. As strong of a game as both teams played in the first two games of their Ontario University Athletics east division final series, it will all come down to one final game. After six games—all but one of which was decided by a single goal—three overtimes, 29 goals and a season of incredible playoff-level hockey, the Concordia vs. McGill rivalry comes down to one final game that will propel the winner to the Queen’s cup final. And they set that stage, perfectly. “It was a great game on both sides,” said Stingers captain Phil Hudon of the 3-2 overtime loss. He and his team may not have gotten the result they wanted but they certainly treated their largest crowd of the season to an incredible show. Ed Meagher arena was packed beyond its capacity. Many fans were forced to stand along the boards throughout the game for lack of seating space. 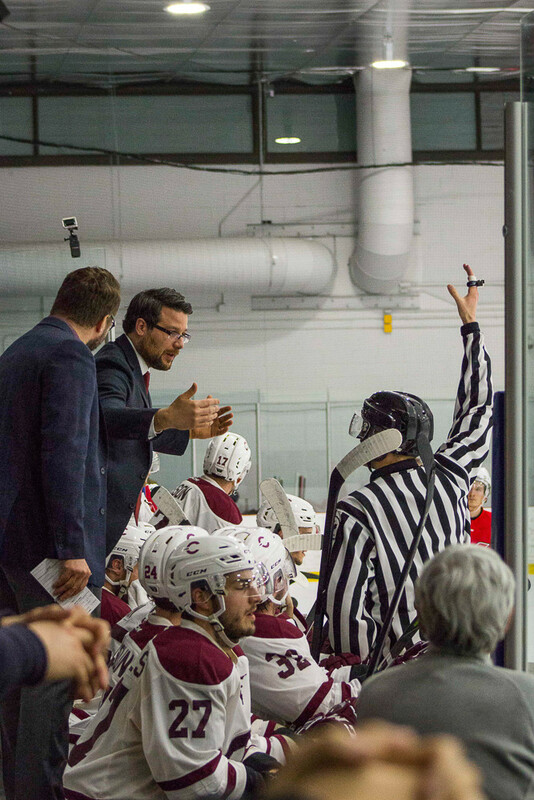 Even those with seats spent plenty of time on their feet, jumping as the OUA east’s top teams traded scoring chances. “That was unbelievable. It gives you that extra drive, it was unreal. We’re sorry we didn’t win for them. We’re going to have to do it Sunday,” said Hudon, who scored the game’s opening goal. Hudon’s head coach Marc-Andre Element enjoyed the packed house and the atmosphere as well, saying that it shouldn’t be something out of the ordinary. “It should be like that every game. It’s such good hockey,” he said. Game two was as back and forth as hockey gets. Both teams applied constant pressure yet never led for long as the two traded goals for the first two periods in quick succession. It seemed as if every few seconds, one team came up with a shot that looked like a sure goal. Unfortunately for the Stingers, who put 52 shots on net, McGill goaltender Louis-Philippe Guindon treated them to the type of performance that Stingers goalie Marc-Antoine Turcotte did in game one. Guindon was an absolute wall with 50 saves on the night. His glove robbed Hudon and his linemate Anthony Beauregard of goal after goal throughout the night. He was without a doubt, the game’s first star. Despite the result, the Stingers’ eyes are on the future. “As hard as it sounds, we’ve got to turn the page immediately. Tomorrow is a new day,” said Hudon, noting that the team won’t let itself be “bogged down” because of the loss. 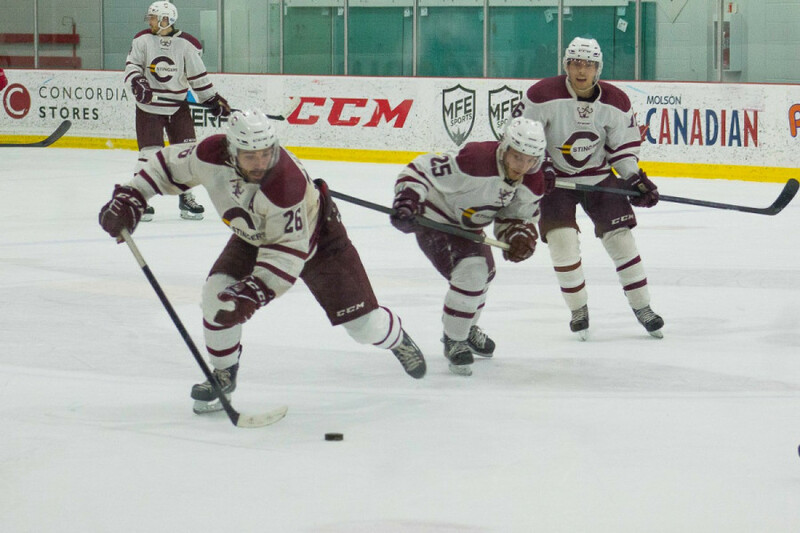 The team’s focus is on winning game three at McGill on Sunday and continuing their perfect 4-0 road win streak since the start of the playoffs. Element believes his team will bounce back after a frustrating overtime loss. “It was a really good game. For sure,it’s not fun tonight but we want to win the series. We’ve got to go back there and work,” said Element. He has good reason for his confidence. Just a weak ago, his team was in the exact same position after a frustrating game two loss at home to Queen’s. They would end up with a 3-2 overtime victory in Kingston two days later, a feat the team looks to repeat against McGill. While Hudon cautions against overconfidence coming from the team’s road record, he acknowledges that playing in other teams’ arenas is something the Stingers are comfortable doing. While it may be called a game three, the game at McGill is really a game seven. 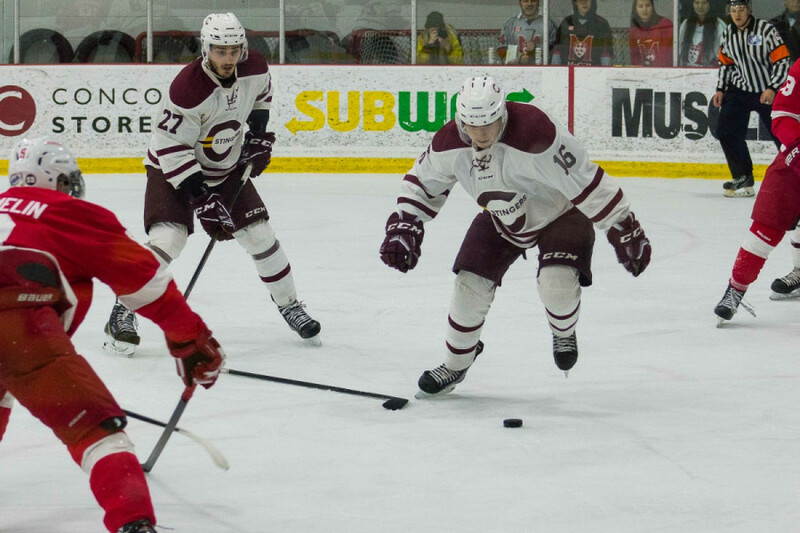 A culmination of a battle that started back in Concordia’s very first game of the year, a 3-2 win at McGIll. Counting the playoffs, each team has three wins and three losses in the series. Hudon has no problem going to McGill to end the year long rivalry battle away from home. The series, a U Sports national tournament berth, the OUA east crown, and crosstown bragging rights are all on the line Sunday night, 7 p.m. at the McConnell Arena.